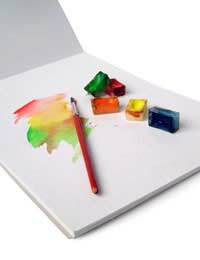 Watercolour is a medium often overlooked as old fashioned and suited only to landscape sketches. This is unfair as watercolour has unique opportunities to be used either experimentally or as it is traditionally intended. Watercolour paints are paints that can be diluted and manipulated by water making them easy to use outdoors, or indeed anywhere. Watercolour usually comes in thin small tubes or in small plastic trays (called ‘pans’) and tends to be painted on to paper with a brush. The medium is historically popular throughout Europe and the Far East as well as in India and in Ethiopia, and the paint most commonly referred to as ‘watercolour’ is bound by water soluble carbohydrates, these days usually glycerine or honey. Watercolour is thought to go back as far as cave painting, being developed over time into both a medium for intense and accurate botanical and anatomical sketches as well as for preparatory drawings. It tends, in the U.K, to be associated with landscapes built up using thin washes of watered down paint. The slight translucency of watercolour paints makes it ideal for capturing the ethereal and fleeting elements of natural landscapes. For more solid effects thicker more opaque watercolour paints may be used, such as ‘gouache’, which has chalk added, and ‘bodycolour’, which has a high concentration of pigment. A heavy specific ‘watercolour paper’ is often used for watercolour painting that will not buckle or tear when wet and will be both absorbent and resistant enough to carry and hold the paint well. Using watercolour differs from using other paints, purely because of the amount of variables presented by the manipulation of paint with water. A water-colourist has to be led by the water as much as they are in control of it. This has led, in part, to its popularity in Far Eastern countries, where the use of watercolour with brush is practiced in a free-flowing way that accords with the principles of spiritual practices such as Zen Buddhism and Taoism. In Europe the use of water colourists tend to try by building up washes to eventually achieve a likeness of a real landscape. This is achieved through gentle trial and error until a likeness can eventually be seen to appear. After time the water colourist will develop techniques that allow them to loosely control their paint from the offset, although they will always be party to the fluid and random nature of the movement of water. Many effects used in watercolour painting are achieved using a ‘wet in wet’ technique, whereby wet paint is applied with the brush to an already wet surface. Alternatively, dry paint is applied to the surface then drawn with for greater precision. This latter is most common in detailed botanical and anatomical drawings. Other considerations surround the reaction of pigments to light, and the change in colour of paints during the drying process. Factors such as these make watercolour a slow contemplative process that is ideal in developing a relationship with the artwork that one does not have complete control over.